Mumbai, 3rd January 2019: Kumbh Mela, the largest peaceful congregation of pilgrims on earth and recognised by UNESCO as an Intangible Cultural Heritage of Humanity, has a history that dates back to thousands of years. The grandeur of the cultural extravaganza celebrated at four different cities in India, over a period of 12 years, draws throngs of devotees seeking spirituality and nirvana, bathing at sacred rivers to purify their sins. The Allahabad Kumbh Mela scheduled for January 2019 is believed to be one of the most sacred pilgrimage places for the Hindus, held at the confluence (Triveni Sangam) of the Ganga, the Yamuna, and the mystical Sarasvati. Hindu holy men sporting dreadlocks and smoking from their chillums (pipes) or practising complex asanas are sights that greet you here. The environ is cosseted with chiming bells, incense and flower fragrance interspersing flawlessly with the smoke from the havan kunds (fire places), vedic hymns, mantras, drumbeats, the blare of conchs and the ring of holy bells. On the invitation of Shri Shri 108 Mahant Late Shri Bala Krishna Das ji Maharaj & his son Shri Bipin Bihari Pandey ji Maharaj at Shri Ramanandiya Vaishnav Ashram Pratisthan Puri, Samudra Koop Tirth, Jhusi, Allahabad, The Ultimate Travelling Camp (TUTC) will soon be traversing to the holy land to launch the ‘Sangam Nivas’ Camp and introduce travellers to an unparalleled, multi-sensory journey into the very heart of the Kumbh Mela. TUTC’s latest offering – Sangam Nivas aims to provide the quintessential essence of the Kumbh Mela to seekers of spirituality and well-being, while bringing forth the holistic aspects of Indian philosophy and mythology. Positioned at the highest point of the Kumbh Mela, Sangam Nivas is on a hillock overlooking the Sangam and offers the perfect vantage point for guests to soak in the atmosphere and understand the essence of the Kumbh. The camp is at a one hour driving distance from the Allahabad airport, five hours from Lucknow and three hours from Varanasi. The closest rail-head is Allahabad junction which is well connected to Delhi, Howrah and Mumbai. Guests can choose from specially appointed spacious 17 Luxury tents and 27 Super Luxury Deluxe tents equipped with modern amenities and ornate bespoke furnishings. The Sangam Nivas Camp offers exceptional services such as Unlimited Wi-Fi at the Reception Tent, 24/7 security and paramedic on site, 24/7 electricity, the library at Reception Tent, Wellness Center for rejuvenation and Temple for the evening ‘Aartis’. Each tent has an ensuite bathroom with access to 24 hours running hot and cold water. One can choose from a one-night to a five-night itinerary to enjoy the best of the religious fervor. 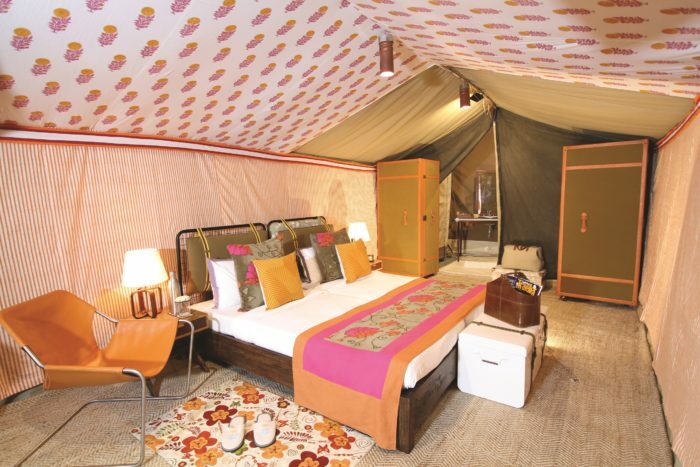 The camp has weaved in exclusive activities specially curated to enhance the Kumbh Mela experience. Witness the sea of fervent devotees performing their rituals and offering prayers or choose to visit the various Akharas to get comprehensive view on the ideology and philosophy of different sects of Hinduism. Partake in morning Yoga and Meditation classes held for guests staying at Sangam Nivas or enjoy the Kumbh Mela on an early morning boat cruise and watch devotees by the river banks perform ablution and offering prayers to their divine deities with hymns & mantras being chanted in unison. Interact with Sadhus and Seers to understand the true essence of tapasya and self-sacrifice to attain self-realization or capture the mystical milieu of humankind and faith on camera as part our photography excursions. TUTC is known for celebrating the distinctive taste of Indian cuisine at each of its camps. Guests will be treated to simple yet unique culinary experience where vegetarian including ‘satvik’ food, freshly baked breads, pies and cookies will be prepared by our Chefs. Sangam Nivas will be operational from 10th January to 6th March 2019. Disclaimer: The Daily Brunch does not hold the rights to the content or the image. Is Your Child a Victim to Body Shaming?